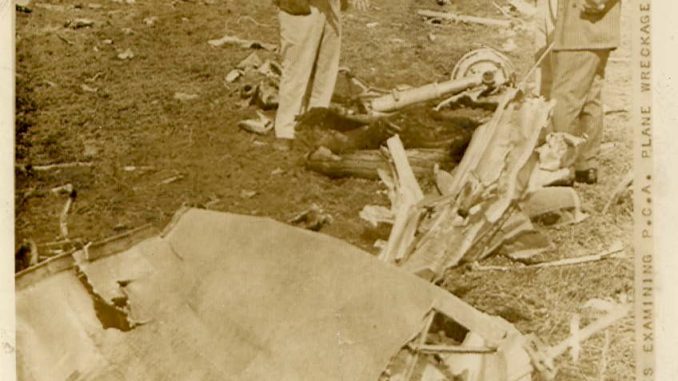 The Lovettsville Museum has recently acquired a number of original news photographs taken at the scene of the Aug. 31, 1940 airliner crash near Lovettsville. And as a result of the articles written by John Flannery and published in the Brunswick Citizen, a letter was received from another eyewitness, who was a young boy at the time, who sent his recollections of the tragedy. All of these items will be compiled into a display at the Museum. We also are bidding (on eBay) on an original copy of the edition of the New York Times which reported the accident on its front page. We already have original copies three other newspapers — two Washington D.C., and one Loudoun — which reported on the crash with photographs. We appreciate the contributions of local citizens who have donated money to help us acquire these items so that they can be displayed and viewed by the entire community. In keeping with our mission to preserve the heritage of the Lovettsville area, we acquire new items for display either through donation, or in some cases by purchasing items of local interest at auction, or on eBay. From time to time, items originating in Lovettsville (such as old business advertisements) are put up for sale on eBay by sellers from across the country. When possible, we try to purchase such items to bring them back to this area, so that they can be displayed in the Museum and thus made accessible to the Lovettsville community. Donations to help us in this endeavor are deeply appreciated — and they are also tax deductible.